How would you like to try a burger without the bun? Eeva, from our product development team, has come up with a meal that is right up your alley. 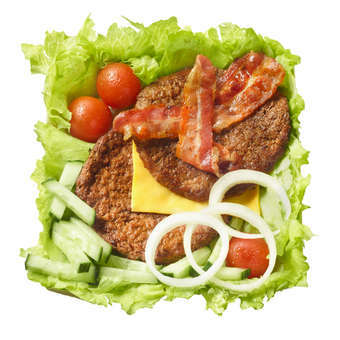 The Burger salad has two, hearty all-beef patties, crispy bacon, cheddar cheese, fresh onion, cherry tomatoes, fresh cucumber and a crunchy iceberg salad. The salad comes with your choice of mayonnaise or salad dressing and seed mix or croutons. Thanks, Eeva!